This detailed guide covers almost every rhythm any nurse or clinician will ever need to worry about. 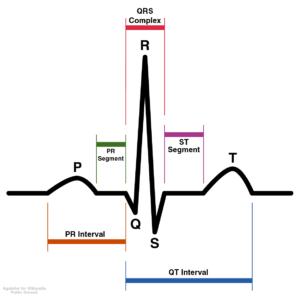 There are 2 ways of classifying EKG rhythms making it a whole lot easier to interpret any rhythm presented to you, be it in clinical setting, in class, ACLS or in an EKG Rhythm Test. I have even included a rhythm practice strips with answers and explanation. Classification based on Rhythm rate and pulse. This might not be the best way to classify them all. The second method is better. These are cardiac rhythms that are slower than 60 beats a minute. Most of them either originate from Atria-ventricular node, Bundle of His or purkije fibers. These are cardiac rhythms associated with fast heart rate above 100 beats a minute. The second method of classifying EKG Rhythm is based on the origin of the impulse. This is a better way to classify EKG Rhythms than the one above. Pace maker rhythms – Originates from artificial pace maker devices. The normal sinus rhythm (NSR) denotes a specific type of sinus rhythm where all other measurements on the ECG also fall within designated normal limits, giving rise to the characteristic appearance of the ECG. Sinoatrial arrest AKA sinus arrest or sinus pause occurs when the the sinoatrial node of the heart transiently ceases to fire. The results is a missed beat. Sinus Bradycardia. A regular heart rhythm originating from SA-Node but slower than 60 beats a minute. Sinus Tachycardia. Asinus rhythm is a regular elevated rate of impulses greater than 100 beats/min (bpm) in an average adult. Atrial Fibrillation (A-Fib). A quivering irregular heart rhythm (R-R intervals are irregular) with no predictable pattern and no desirable P wave. It is said to be “Irregulary Irregular with no desirable P wave. Causes · High blood pressure. · Lung disease, such as COPD. Atrial Flutter. An abnormal heart rate, or arrhythmia that occurs when the atrium beat too fast, approximately 350 beats a minute and the ventricular rate is much slower. Multifocal Atrial Tachycardia: Multifocal atrial tachycardia (MAT) is a cardiac arrhythmia caused by multiple sites of competing atrial activity. It is characterized by an irregular atrial rate greater than 100 beats per minute (bpm). Atrial activity is well organized, with at least 3 morphologically distinct P waves, irregular P-P intervals, and an isoelectric baseline between the P waves. Edward Burn’s Blog has good explanation. Premature Atrial Complex (PAC): A premature beat arising from an ectopic focus within the atria. PAC’s occur when a beat occurs early in the heart cycle than expected. One of the most common symptoms of APCs is heart palpitations or unusual awareness of your heartbeats. Alcohol, stress, fatigue or poor sleep, medication that lists irregular heartbeat as a side effect. Supraventricular Tachycardia (SVT): By definition, it is a rapid heart rate, usually above 150 beats per minute with impulses originating from the ventricles. For the purpose of this lesson, I will not get into the details about different types of SVT. It may not be of much use to a nurse. Wandering Atrial Pacemaker (WAP): A wandering atrial pacemaker is an atrial arrhythmia that occurs when the natural cardiac pacemaker site shifts between the sinoatrial node (SA node), the atria, and/or the atrioventricular node (AV node). The name defines what is happening and paying close attention to the morphology of the P wave will make it easier to recognize the rhythm. Notes T wave normal. If heart rate exceeds 100 bpm, then rhythm may be multifocal atrial tachycardia (MAP). P waves may have upright and downward facing morphology depending on the origin of the impulse. Wolff-Parkinson-White Syndrome: Wolff-Parkinson-White (WPW) syndrome is a condition in which there is an extra electrical pathway in the heart. Causes Usually a rare hereditary condition. EKG Rhythms Interpretation: Atrial Ventricular Rhythms. These rhythms are sometimes called Nodal rhythms or Conduction blocks. Some EKG instructors may combine them with Junctional rhythms classification. These are MUST KNOW for nurses and most clinical healthcare professionals. 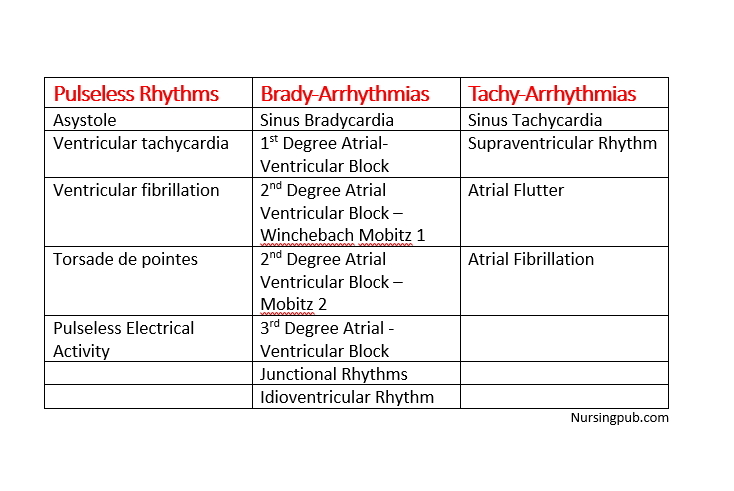 For critical care nurses preparing for CCRN exams, I highly recommend you listen to Laura Gasparis emphasis on these rhythms. Notes The most distinct feature of a bundle branch block is the wide QRS. 1st Degree Heart Block: First-degree atrioventricular (AV) block, or first-degree heart block, is defined as prolongation of the PR interval to more than 200 msec. Second Degree AV Block – Type 1 (Winchebach or Mobitz 1): Mobitz 1 heart block is characterized by progressive prolongation of the PR interval on consecutive beats followed by a blocked P wave (i.e., a ‘dropped’ QRS complex). After the dropped QRS complex, the PR interval resets and the cycle repeats again. Second Degree Heart Block Type II: In Type II (Mobitz) AV block the PR intervals are constant until a nonconducted P wave occurs. There must be two consecutive constant PR intervals to diagnose Type II AV block. The RR interval of the pause is equal to the two preceding RR intervals. Third Degree Heart Block AKA – Complete heart Block is a disorder of the cardiac conduction system where there is no conduction through the atrioventricular node. Therefore, complete dissociation of the atrial and ventricular activity exists. The P waves and QRS has no correlation. Since the QRS is originating from the ventricular impulses, the rate is usually less than 40 beats a minute. Accelerated Junctional Rhythm: (AJR) occurs when the rate of an AV junctional pacemaker exceeds that of the sinus node. Junctional Escape Rhythm: A junctional escape beat is a delayed heartbeat originating not from the atrium but from an ectopic focus somewhere in the AV junction. It occurs when the rate of depolarization of the sinoatrial node falls below the rate of the atrioventricular node. This dysrhythmia also may occur when the electrical impulses from the SA node fail to reach the AV node because of SA or AV block. Junctional Tachycardia: It is a form of supraventricular tachycardia associated with the generation of impulses in a focus in the region of the atrioventricular node due to an A-V disassociation. Since the intrinsic rate of ventricles is 40-60 beats per minute, Junctional tachycardia has a rate above 60 beats a minute. Ectopic ventricular rhythms occur commonly in acute myocardial infarction. The rate is usually 20-40 bpm. If the rate is >40 bpm, it is called accelerated idioventricular rhythm. The rate of 20-40 is the “intrinsic automaticity” of the ventricular myocardium. It can be regarded as a “backup plan” or “redundancy” built into the body. Accelerated Idioventricular Rhythm: Defined as an enhanced ectopic ventricular rhythm with at least 3 consecutive ventricular beats, which is faster than normal intrinsic ventricular escape rhythm (≤40 bpm), but slower than ventricular tachycardia. AIVR results when the rate of an ectopic ventricular pacemaker exceeds that of the sinus node often associated with increased vagal tone and decreased sympathetic tone. Premature Ventricular Complex (PVC): A premature beat arising from a single or multiple ectopic focus within the ventricle.